Wire: “President Clinton, President Reagan. And if you look at them, you can criticize them for lots of things. 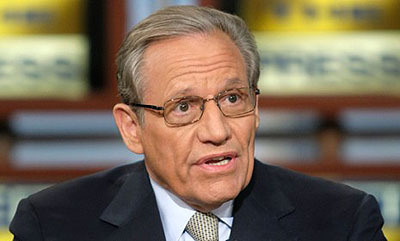 They by and large worked their will,” Woodward said. “On this, President Obama did not.” He added, “Now, some people are going to say he was fighting a brick wall, the Republicans in the House and the Republicans in Congress. Others will say it’s the president’s job to figure out how to tear down that brick wall. In this case, he did not.” Does the Woodward book on such an ugly inside the Beltway fight have legs in the swing states in these final days? We’ll see. This prompts the following question: what’s up with Bob Woodward, anyway? Woodward is more conservative than me, but I don’t really get the sense that he’s especially in the tank for either Romney or Obama. He was certainly plenty critical of George Bush. So how can he say stuff like this? How can he seriously entertain the idea that anything could have persuaded Republicans to deal with taxes as well as spending? I have no idea, really, but my theory is that he’s just stuck in the past. He’s never really internalized the Gingrich revolution and what it’s done to the GOP over the past couple of decades. This is peculiar in the extreme since Woodward, more than almost anyone, has been reporting on this stuff in agonizing detail the entire time. If anyone should know what’s going on here, it’s him. And yet, he seems to still be living in some nostalgic past where Tip and Ronnie sat down to hash things out over a beer or two and always ended up saving the world. I’m not quite sure what else it could be. You can criticize Obama for his performance in the debt ceiling fight. You can pick out specific offers and counteroffers and withdrawn offers and say that Obama misplayed things. That’s fine. But at the end of the day, there’s really no question about two things. First, Obama was willing to make some fairly substantial spending cuts, including cuts to entitlement spending, that would have enraged his base. Second, John Boehner was completely and absolutely unable to get his caucus to agree to so much as a dime in tax increases. Like Woodward, I’d like to think that there was some way for Obama to tear down that brick wall. But is there any evidence that such a way existed? Any evidence at all?